2658 Sunnyside Road, Findley Lake, NY.| MLS# R1170509 | Chautauqua Lake Real Estate Services. Informed, Professional Real Estate Information Serving Buyers and Sellers Interested in Lake Chautauqua Real Estate and Chautauqua County NY Real Estate. Rick and Julia McMahon Real Estate Advantage Since 1992. 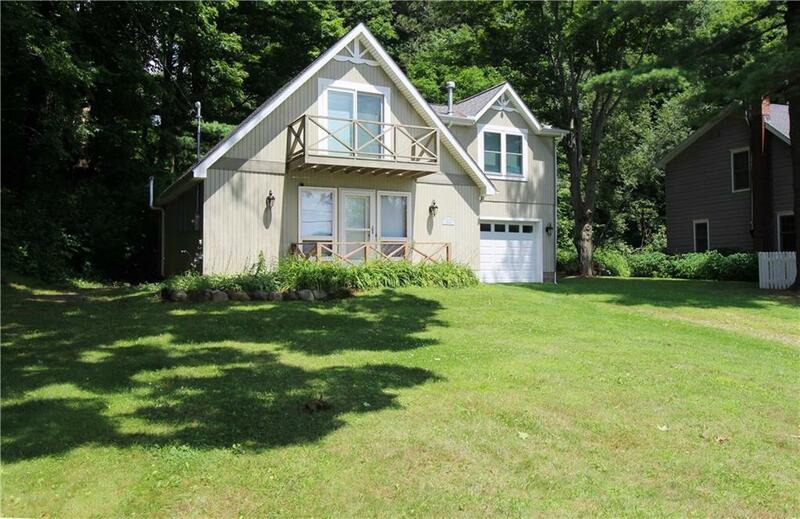 Be ready to enjoy lake living in this newly renovated year-round lakefront home designed for carefree living. The open floor plan features a great room with large windows to capture the lake view. A bedroom, bath, and laundry complete the first floor. The private, tree-shaded rear deck has a charm all its own with woodland views. There's access to a storage room off of the deck, then up a few steps to a rooftop deck overlooking the lake. Wake up to your own view of the lake in the second story master. Another bedroom, bath and sitting area with a lakeside balcony complete the second story. There's ample storage throughout the home and the attached garage. The lakefront has a large swim platform and dock. A perfect lakefront retreat just minutes to golf and skiing. Directions To Property: Take I-86 To Findley Lake. From The Center Of The Village Turn Onto Sunnyside And Look For Sign.